Don't ever lose your sense of wonder with these Dinosaur Fine Art Prints created by me, Blake Hunter. "Hi my name is Blake and I like Dinosaurs." That's usually my icebreaker for introducing myself at any Event, Market, Fair, or Festival I'm attending. I believe you can tell what type of person someone is by their response. Some quick advice, if someone flat out tells you they hate dinosaurs there is something seriously F@#$%d up with them and you should probably run away. Anyways, the first movie I ever saw was "Jurassic Park" and it always left a lasting impact on my imagination. My Mom also shared this fascination with our prehistoric past and would spend countless hours watching every "Jurassic Park" movie over and over. These works were inspired by my love of those memories and by those mighty creatures who forgot to eat Samuel L. Jackson's arm, blinded and killed Newman, and Ate the Lawyer taking a deuce. This Series started last year with the ever popular #REXY who has made many appearances in my Home Goods and Jewelry Line. 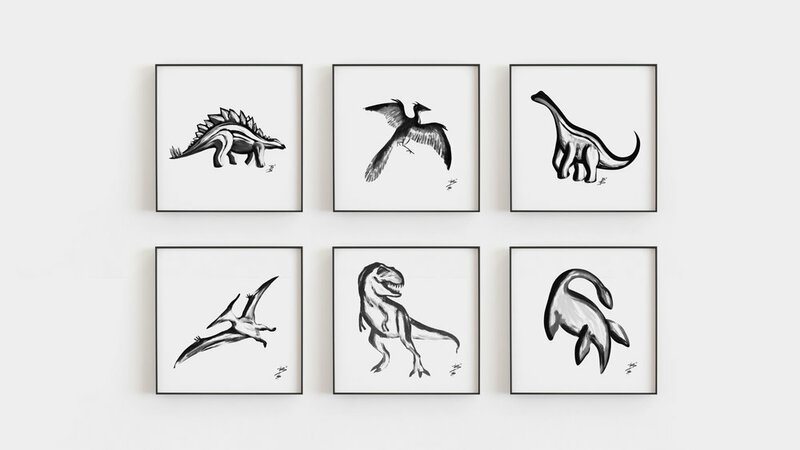 Now, new editions #BROCK the Brachiosaurus and #GREGG the Stegosaurus have expanded the collection to six unique and trendy takes on these prehistoric beasts that will add a touch of class and wonder to any room. Adults and Children alike will be instantly drawn to the simple black brush strokes that forms each prehistoric depiction on a modern white background. These Prints will make excellent gifts for the dinosaur lovers in your life. They also look classy and adventurous in children's nurseries and playrooms, offering something educational and beautiful that never get old or out of style. Someone of any age can appreciate these nostalgic throwbacks to our childhood.